I’m Deeann, Certified Life Coach with a specialty in alopecia areata. As a life coach, I bring not only my own experience of living with alopecia for almost forty years, but also a desire to make a positive impact and serve others who are looking for ways to move forward in their hair loss journey. Head-On Life Coaching is a unique combination of consulting and coaching for women, men, and children & their families living with alopecia areata. For over thirty years, I had never met anyone else with alopecia. Even though I had supportive family and friends, I didn’t realize the importance of sharing my experience with those who really understood. There weren’t support groups, positive role models, or any books that showcased people who shared my condition. I became passionate about making a resource available for all of us, and to provide it as a community education piece. I published Head-On, Stories of Alopecia three years ago. As I began writing the book, I looked for one prevailing piece that would tie it all together. Was there just one answer? Yes…and.. No! I discovered the common thread was really a road map of determination. Everyone’s hair loss journey is different. 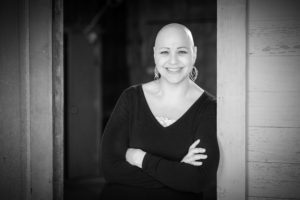 How we each discover who we are at the end of the day, with or without hair, is a positive step toward not only living with alopecia, but also thriving with it. Whether you feel stuck, feel as if there are too many/not enough options, or want to create community awareness, life coaching is a great way to jump start the process. As someone living with alopecia, I understand the reality of feeling paralyzed by limiting self-beliefs and by societal standards we are all held to, along with the helplessness of the unknown. As a coach, I will meet you where you or your family are to co-create goals that work for you. Coaching is also great for parents who have a child living with alopecia. It is an effective way to find ways to support your children as they look to you for guidance. Finding answers is often the first step in coming to terms with alopecia. Being fully informed helps create the next natural step in moving forward. If you are looking for a coach who is invested in your success, reach out and take your first step. Let’s get acquainted. Your discovery call is a great way to figure out if life coaching with me is a good fit. Click the link below, Email me at alopecialifecoach@gmail.com, or give me a call at (360) 391-5428. I live in Washington State, and have appointments available for all time zones by video conference or in-person. I look forward to working together to find answers, step forward, and reclaim your power. Let’s do this!